The Food and Drug Administration’s “black box” warnings and advisories give important safety information about drugs. But they can sometimes go too far and harm more people than they help. Depression in young people is a disabling and stigmatizing illness, both in the U.S. and around the world. It is the leading cause of suicide, which climbed by about 50 percent among adolescents between 2003 and 2016. In October 2004, the FDA required a so-called “black box warning” of this risk to be printed on the labels of all antidepressant drugs. It was implemented in January 2005. Two years later, the FDA extended the same warning to include young adults, again based on industry studies. Each announcement was accompanied by a slew of media reports about the link between antidepressant use and suicide that exaggerated the danger message. All antidepressant prescriptions still contain this frightening black box warning, and the message is repeated in TV ads. In an effort to monitor and reduce suicidality — including suicide attempts — among young people, the FDA also urged clinicians to ask about suicidal thoughts every time they prescribed antidepressants to a young person. The FDA was undoubtedly acting with good intentions. But the warnings reduced the use of both antidepressants and talk therapy among young persons with depression, with the unwanted consequences of reducing its diagnosis and treatment. This was followed rapidly by an increase in suicidal behavior. We used a simple and clear way to measure the effects of these antidepressant warnings. Called the interrupted-time-series design, this rigorous method graphically displays how the warnings resulted in sudden and harmful breaks from existing trends. Up to half of people with depression are not treated for it; some commit suicide as a result. In a study of 55 million managed care enrollees, the FDA warnings led to an almost 40 percent reduction in the identification of adolescent patients with major depressive disorder, an important predictor of suicide. The researchers also saw a significant reduction in diagnoses among young adults. This began soon after the first FDA advisory in October 2003. It continued after the FDA black box warning for children and adolescents started in 2005 and the one for young adults began in 2007. These data appeared in a different format in Archives of General Psychiatry. They are used here with permission from lead author Anne Libby of the University of Colorado at Denver and the journal’s publisher. In the years following the FDA’s first antidepressant warning in October 2003, there was a sudden, nearly 50 percent decline in the use of antidepressants among more than 400,000 poor children and adolescents in Tennessee who were covered by Medicaid. It’s hard to believe that this was not an unintended result of the warnings. These data appeared in a different format in Archives of Pediatric and Adolescent Medicine. They are used here with permission from senior author William O. Cooper of Vanderbilt University School of Medicine and the journal’s publisher. Mental health advocates hoped that any decline in antidepressant use following the FDA’s warnings would be matched by increases in face-to-face psychotherapy to treat depression and improve detection of suicidal behavior. But that didn’t happen. Psychotherapy among all patients with major depression declined after the warnings. The reduction was almost identical in adolescents and young adults. Clearly, the FDA’s recommendation that clinicians increase monitoring of patients for suicidal thoughts and behaviors did not occur. Based on data from 11 health plans with more than 7 million people, a study we published in BMJ demonstrated two dramatic outcomes of the FDA’s antidepressant warnings and the associated publicity over a 10-year period: a sudden 31 percent reduction in antidepressant use among adolescents and a 24 percent reduction in young adults, with a simultaneous increase in poisonings due to the use of psychoactive drugs such as tranquilizers like Valium and antipsychotic drugs, a method that adolescent girls often use to attempt suicide. These were the consequences not only of reductions in medication, but also of reductions in diagnosis, psychotherapy, and monitoring, as well as a general chilling atmosphere for depression treatment created by overblown media reports of a link between antidepressant use and suicide. Reproduced with permission from lead author author Christine Lu of Harvard Medical School and Harvard Pilgrim Health Care Institute and The BMJ. 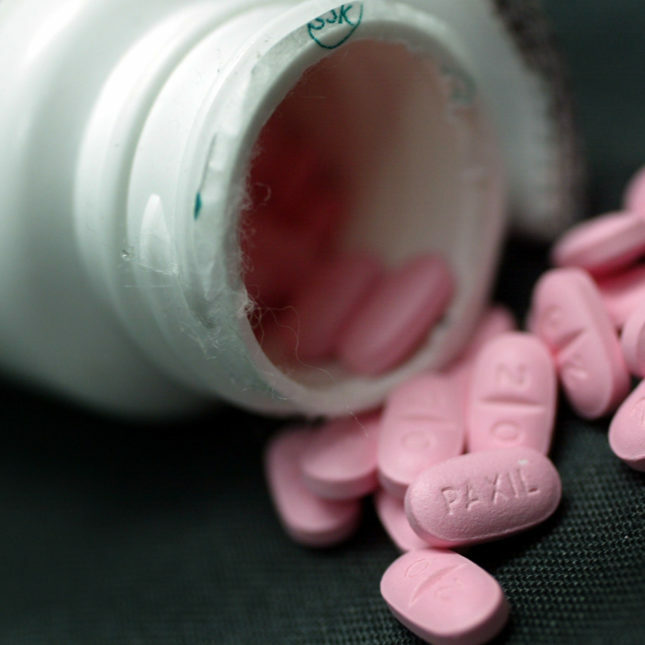 Researchers have been evaluating the impact of the FDA’s antidepressant warnings for years. A 2008 study, for example, documented possible increases in completed suicides as a result of the warnings. Earlier this year, the Centers for Disease Control and Prevention confirmed that suicide attempts among teenagers have doubled in the last decade. 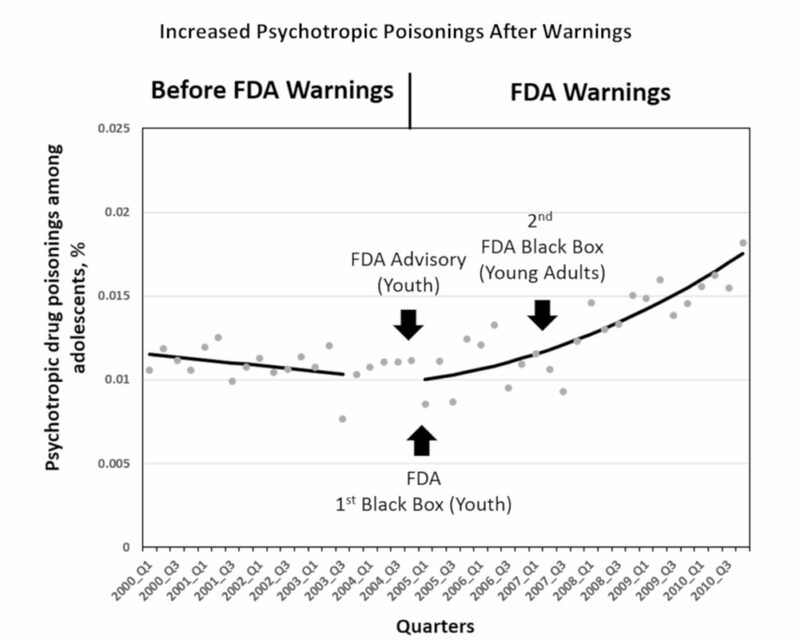 While this research wasn’t intended to isolate the effects of the warnings, it suggests that suicide deaths increased simultaneously with the continuation of the black box warnings. Data from the National Vital Statistics Reports, June 1, 2018. 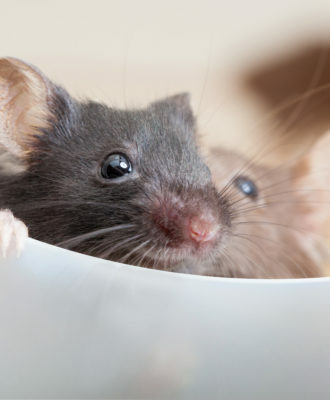 There are now even more high-quality studies, some up to a decade long, from diverse environments and involving tens of millions of individuals, showing increased harm following the warnings, sometimes almost immediately. The FDA knows that drug warnings are seldom totally harmless, and it carefully weighs the tradeoffs. The antidepressant warnings may have made sense to the FDA at the time, though critics have long charged that the data on which the FDA based the warnings are flawed. But the body of evidence that has been accumulated since then overwhelms the analysis that prompted the FDA’s decisions. The risk of suicidal thoughts and behaviors and suicide attempts among youths, adolescents, and young adults due to taking antidepressants was never as high as the risk due to untreated depression. Yet just this spring, an FDA representative, rather than admitting the error, dismissed the effects of the warnings on antidepressant use in an article in the journal Medical Care, ignoring the threat to the mental health of young people. It’s time for the FDA to acknowledge this miscalculation. 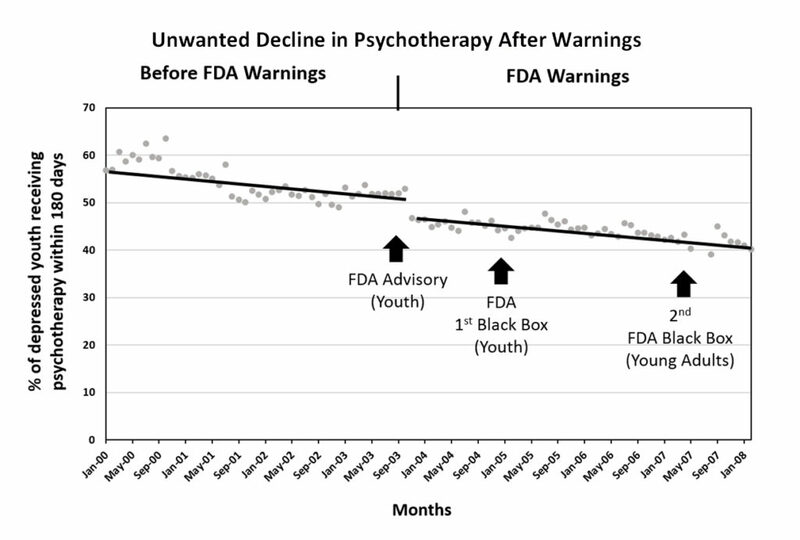 Going forward, FDA policymakers should consider working with researchers who study the antidepressant black box warning about suicide. Because it continues to dampen effective drug and non-drug treatment and monitoring for depression — and because teen suicide attempts are accelerating — it’s appropriate to think about removing this warning. Stephen Soumerai is professor of population medicine, founding and former director of the Division of Health Policy and Insurance Research, and teaches research methods at Harvard Medical School. Ross Koppel is adjunct professor of sociology at the University of Pennsylvania, where he is also a senior fellow at the Leonard Davis Institute, the Institute of Biomedical Informatics, and the Center for Public Health Initiatives. Caitlin Lupton, an administrative specialist for the Division of Health Policy and Insurance Research, created the graphs for this article. Over the last 30 years, I have personally initiated antidepressant treatment with over 4000 children, adolescents, and young adults. The incidence of acutely increased suicidal thinking appears to be about 0.5%— and this is in a population of depressed patients in which over 30% report suicidal thoughts at initial evaluation. The issue is “risk benefit analysis“ and the major US and international epidemiological studies strongly suggest that increased antidepressant prescribing was associated with decreased suicide! I just don’t understand why so many otherwise intelligent professionals are willing to jump on the bandwagon of a few highly vocal Rx nihilists. You refer to studies with 400 or 200 patients followed for 8 weeks as large. If he suicide rate is 0.5% (your number but you omitted any time period) then you expect maybe 2 in a study of 400 if your rate is over 8 weeks. That size study cannot answer any medium term efficacy or side effect question. There are no true placebo trials since the drugs have obvious effects (metallic taste, dry mouth etc.). So there is no data for any of your assertions. There is only wishful thinking and marketing. People that question this prescribing are “pharmaceutical nihilists,” not entitled to question anything here. This comment is more inline with one of those testimonials, usually found on alternative medicine sites. It is doubtful any of those 4000 subjects were followed for any length of time. The commenters financial disclosure is not present either. Most people want to assuage their guilt and responsibility by reinforcing denial. There is certainly not enough information here to make any kind of informed opinion. That is also typical of the alternative medicine community too. Going by the only numbers available here, 4000 prescriptions in 30 years, and 30% of the patients reporting suicidal ideation, means this Doctor was working with private clients. This cohort would have been more comfortable, with caring, supportive and engaged parents. Most prescribing decisions would have been made more carefully than in a situation with lower income, traumatized, Minority, or financially insecure patients. It would be interesting to know how these former patients would report their reactions to medication at the time. There is no way to gauge anything from this comment, by design. The Pharmaceutical industry recruits people to comment with carefully prepared comments like this one. The marketers and public relations branch of the Pharma industry, found that they could influence conversations, with these “expert” but unscientific testimonials. There is a lot of money at stake here, billions, and the industry monitors every word on social media and sites like this one. They even run metrics on how readers respond to these comments, so they can gauge their effectiveness. They use keywords like “Black-box” or “Antidepressant” to search millions of comments, and articles daily. They also identify “Influencers,” Physicians and others who use their positions to market doubt, products and propaganda, in a seemingly off the cuff way, or appearing to be the writers opinion. There are only 2 allowed positions to any online discussion. The writer categorizes anyone who lost a loved one, or has seen the long term effects, or even questions how these pharma products are prescribed as “Pharma Nihilists.” This casts them into the group with the Anti Vaxxers, and other extreme nonsense characterizations. Positive opinions about non stop pharma marketing, and the drugging of millions of children, are encouraged. The thoughtful and careful use of these drugs and a critical look at the actual data, is not to be promoted. Anyone that questions, the Pharma Funded “Science” and unlimited marketing, is therefore a Pharma Nihilist. Blacks and white thinking is being promoted here to discredit any questioning. Healthcare advertising used to be against the law for a reason. Now it is everywhere. The so called Opiate Epidemic was supposedly created and helped along with pharma advertising, and weaponized targeted advertising. Not one government agency is looking at that topic, or how that relates to other pharma products. 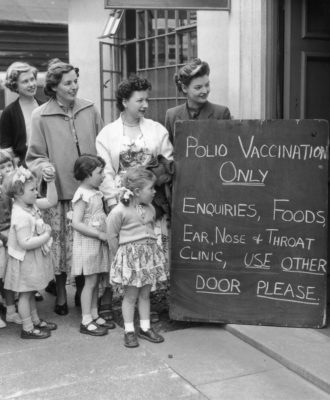 The anti science Anti vaxxers and alternative medicine nonsense was cleverly marketed too, perhaps by Russians, but that topic is off limits too. It is no coincidence that pharma industry insiders decided that including side effects in their non stop advertising was what was wrong with the Pharmaceutical industry. We are way down the rabbit hole now, in a universe of alternate facts. Back when healthcare was actually about health, of the patient that is, physicians listened to their patients and attempted to identify the underlying cause of their distress as opposed to throwing the pill of the week at them after a ten minute chat. When the unbelievably long list of adverse effects from their use or withdrawal appears, yet more drugs are prescribed to ‘cure’ the consequences of the 1st drug. These ADV effects mimic multiple physical and mental disorders, the patient is now diagnosed with something new, and statistics are skewed because doctors don’t attribute the person’s problems to the drug. Benefits of these drugs are greatly exaggerated while the side-effects are allowed to be grossly downplayed with false and misleading words such as “rare” and “uncommon”, which they’re not. If physicians are interested in how these drugs truly affect real humans, all they have to do is ask. Your 4000 patients have joined 70,000+ others severely damaged by brain-altering meds on dozens of online support sites such as “Surviving Antidepressants” because they have little to no support from doctors. The ones who have killed themselves aren’t on there. Even a recent Psychiatric Times article suggested listening to these patients’ lived experience was way overdue. The ADV effects are often not apparent until someone STOPS taking these drugs, which is a very frightening catch-22 on many levels. Many taking these drugs are merely staving off withdrawal by taking their next dose. Perhaps these “otherwise intelligent professionals” you speak of have re-discovered that “First do no harm” thing and have a true desire to see their patients become healthy humans. And before you write off my comments as anecdotal, yours are as well. Please do some current research on the subject. Just saying that epidemiological studies suggest increased antidepressant prescribing associates with decreased suicide doesn’t make it true. Please provide links to these supposed studies. All the science I am aware of says that adolescents benefit little or not at all from antidepressants on the average, and that the suicide rate is the same or higher in adolescents, despite suicidal participants being screened out before the trials. There is nothing I am aware of in the epidemiological data that suggests improved suicide rates on antidepressants, other than this article and one tortured article again using psychiatric poisonings as a proxy for suicide attempts and claiming correlations with the “black box warnings” that proved intentionally deceptive. I disagree with the premise of this article. The real problem with adolescent and pediatric use of antidepressants is that a sufficient number of studies have not been conducted on this specific use. More studies need to be done on the effects, long term and short, of specifically for this unique population before removing these warnings. The truth is, we don’t know whether adult-based antidepressants would be helpful or harmful to a younger population. I would submit that sufficient research has been done to date to suggest that it is unlikely that antidepressants are of any benefit to teens or younger kids. 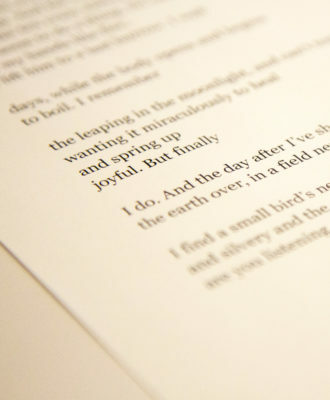 Consider this article, submitted by Cipriani et. al. Cipriani is known to be partial to antidepressants and recently wrote a highly-criticized article trying to paint them in a positive way. Yet Cipriani says that none of the ADs have shown an effect except for Prozac, and that may only be because the number of studies for Prozac is larger which naturally reduces the placebo effect. Note the desire to MINIMIZE the placebo effect, as if it were some annoying side effect, rather than the actual standard by which these drugs should be measured. It should be noted that the placebo effect is also strong for adults, and even the best data suggests that AD effects are minimal in comparison, hardly enough to seem clinically significant on the average. Kirsch wonders if using an active placebo (that induces side effects) would wipe out any effect whatsoever in adults. So whining about a large placebo effect is nothing but bias – these drugs don’t work well for adolescents, and given the side effect profile, should probably not ever be used in that population. That’s what the data says, and this article is simply a tortured attempt to create anxiety about the BB warning instead of looking at the lack of substantive effect that ADs have on suicide rates or any other measure of depression. Your statements omit that there are multiple, large DBPC studies on SSRIs in kids. For fluoxetine, there were 2 with n=400; for sertraline 1-400 and 1-200. Similar studies for escitalopram too. 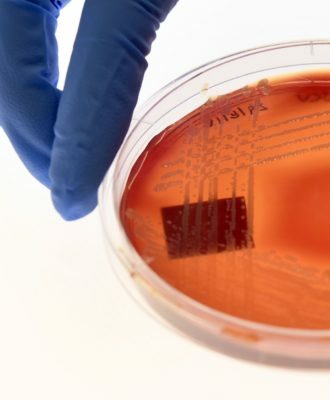 Plus numerous epidemiological studies from around the globe. Should there be more studies? Yes, especially large prospective cohort studies that include a long term follow up component. But it’s simply untrue to say there’s no science that antidepressants work in a pediatric population. Are you saying Cipriani, a big antidepressant advocate, is wrong in saying that the evidence doesn’t support antidepressant use in adolescents? Or that the UK recommendations that ADs not be considered a first line treatment for depressed adolescent are wrong? A short Comment about these Comments. These posts that dare to challenge have been tremendously reassuring to me, a medical professional. Government enforcement of its healthcare “Cultural Revolution” has restricted us to knee-jerk diagnosis and check-box documentation. The dark cloud of AI threatens to replace us. Yet here we are, medical professionals, Still Thinking After All These Years!!! And kudos to Stat, for publishing the comments and taking the heat. Not to mention the title itself, which clearly implies that the FDA is wrong and that there are unnamed dangers that are being ignored. Regardless of unconscious bias, it’s difficult for me to reconcile such conflicting statements – on the one hand, we’re “ignoring dangers” of the black box warning, while on the other hand, trying to figure out the impact of the black box warning is “futile.” How can two such statements be made by the same authors in the same article? To the many who have commented on this article. Please understand that Steve and Ross are professors who focus on health policy, research methods, epidemiology, sociology, and biostatistics. Neither of us has any relationship to the Pharma industry. Both of us recognize the advantages and sometimes tragic unintended consequences of medications. But we have no biases or favored positions in this area. In contrast, we understand that there are many passionate advocates against antidepressants. As to the comments on the first chart: Thank you for reproducing another graph from our BMJ paper. Importantly, you misinterpret the time series of antidepressant use. The red line shows the predicted post-warning trend following a steep increase in baseline trend. There was a large and sudden 31% reduction in medication use from the baseline trend (that is modestly affected by the flattening utilization). The second graph in our essay documents a nearly 50% decline among poor Medicaid adolescents (from a flat trend) soon after the warnings. Second chart: You picked only four points in the middle of 18 years of our CDC data to say that “they show a decrease in suicides.” This is misleading. Suicides are too rare to make a statement like this. Let me refer you to a series of very important publications for journalists to better interpret the trustworthiness of science. It is not possible to detect change without carefully comparing with baseline trends. Such post-only designs are routinely excluded from evidence in Cochrane and other international systematic reviews of health policies and interventions. http://epoc.cochrane.org/epoc-specific-resources-review-authors. Worse, the omitted baseline CDC trend data actually show a steep, pre-existing decline in suicides (1999-2003). Your analysis erroneously credits the warnings for lowering suicide rates when in fact, suicides were already decreasing. It is not possible to distinguish between effects of several closely packed warnings, so concentrating only on black box warnings is futile. A Clarification: We never concluded that the black box warnings led to increased suicides. Our BMJ study (link in essay) states that even in our large population it was impossible to detect effect such rare events. On the other hand, the three strongly designed studies in JAMA Psychiatry, JAMA Pediatrics, and BMJ (not simply descriptive CDC data) led to three conclusions. The warnings—starting in October, 2003 (not 2004)—led to decreased diagnosis of depression, less treatment (psychotherapy and medication), and increased psychotropic poisonings, a proxy for attempts. Given these conclusions and recent increases in suicides documented by CDC, we need to reconsider the use of black box warnings and err on the side of public health. You show your bias in this very comment, by stating that “there are many passionate advocates against antidepressants.” The advocacy you see is for this and other articles relating to antidepressants to be HONEST about the actual facts. You yourselves assert that it’s impossible to know the impact of the black box warning, yet your title clearly implies that the impact is negative. It’s not biased to point out the “spin” that is clearly put out in your article. I’m all for a fair treatment of the facts, but it appears to me that, whether you’re aware of it or not, you are biased in favor of making the black box warning look bad and thereby making antidepressants look like an effective treatment for suicide, despite many articles questioning that premise, particularly in teens. To state that trying to clarify these points and bring such information to light is being “against antidepressants” shows an unwillingness to acknowledge the arguments and research that shows antidepressants not to be a generally viable suicide prevention tactic, especially for teens. You could have written your article from a “let’s consider the overall impact” instead of an “FDA ignores dangers” viewpoint. You did not, which I think shows pretty clearly where your biases run. My understanding is there is data to show there is increased risk of suicide across age groups up to age 40 when all data is looked at. 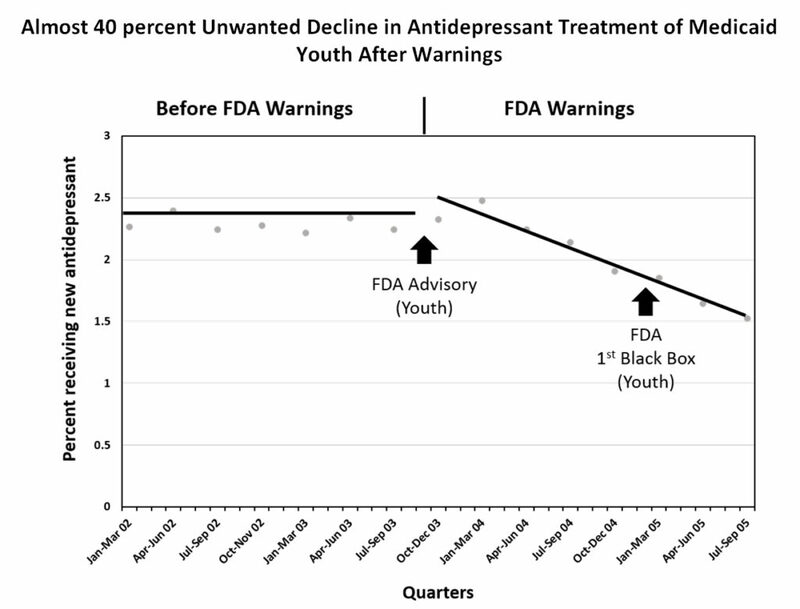 If the black box reduces prescribing of antidepressants then that is saving lives. I would suggest that the psychotropic poisoning’s being used as an indicator of suicide attempts is a big leap – it could be attempts at self medication, or it could be friends or family supplying medication trying to be helpful. There is research showing that depression will reduce in severity for a high percent of affected individuals if they eat healthy and exercise – with that group and the treatment group being in line with each other by 12 weeks, and the non-medication group usually having a higher rate of remission at the 1 year mark. Increased prescribing to youth isn’t the solution. There are many alternate solutions but antidepresssants are not what will save people from suicide. (Spoken as someone who has had multiple suicide attempts, all of them after antidepressants were prescribed. An ssri was the beginning of my mental health battle that involved many years on disability and time in hospital. I can no longer take antidepressants and perhaps not coincidentally, also haven’t experienced any suicidal thoughts since being off of them.) yes I know this is anecdotal, but there are many people with similar stories. We shouldn’t be hasty to try and increase prescribing something that absolutely can decrease quality of life and cause immense suffering. To drive home this point for the public, you published a graphic showing a rise in suicides following the FDA warnings. So, what I did on a blog for Mad in America was put your argument to a very simple fact-check: As the prescribing of antidepressants declined following the FDA, from a high-water mark in 2004 to a low-water mark in 2007, did suicides increase? The answer is that the youth suicide rate declined from 4.7 per 100,000 in 2004 to 3.9 per 100,000 in 2007. Now, as you well know, your earlier study was sharply criticized for the use of psychiatric poisonings as a proxy for attempted suicides, for it includes unintentional poisonings. 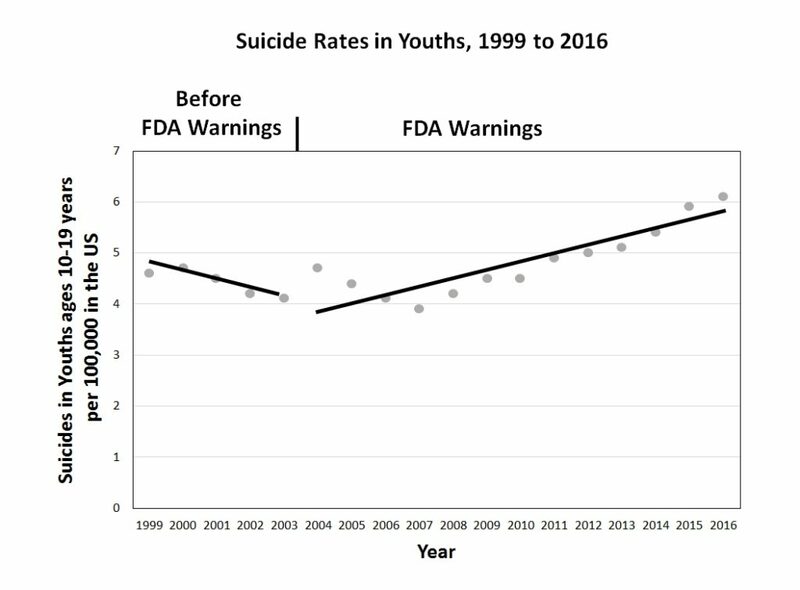 I think all readers would agree that completed suicide among youths is a much better source than your proxy for assessing whether suicides increased in the “immediate” years following the FDA warning, and thus whether the warning led to harm. This is a gem of a response, I must say. I didn’t pick any old four years; I picked the four years following the issuance of the FDA warnings, which you said had led to a “rapid” increase in suicidal attempts. I was checking the facts on the very years you had focused on. Your article wasmeant to sway public opinion on the merits of the black box warning. The duty of the journalist in such an instance is to check whether the “facts” you asserted in making your argument were correct, which is what I did. 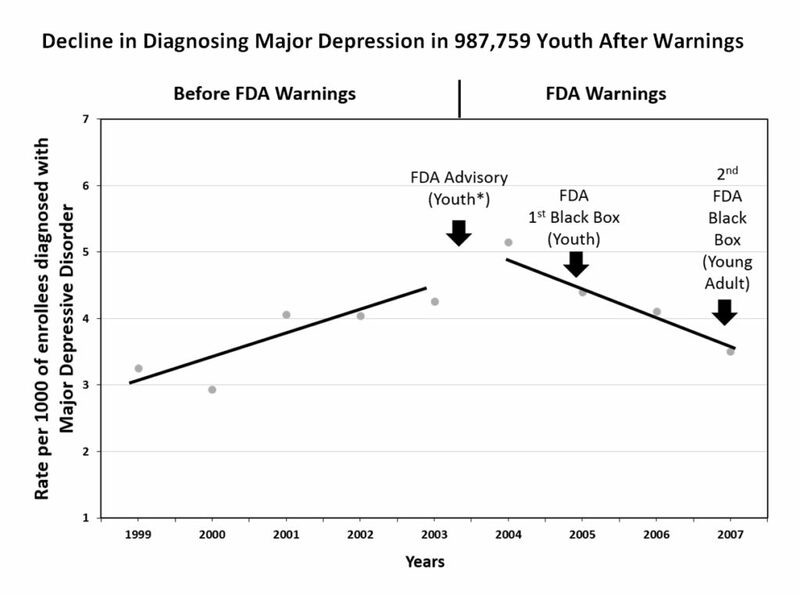 As I am sure you knew, if you had written that completed suicides among youth declined in the three years following the issuance of the FDA warnings, then readers of your opinion piece would have been non-plussed by your argument that the black box warning did great harm, and needed to be removed. This unscientific distorted Advertorial, will use the fact that it was published by STAT, to mislead the public. It will be picked up by a mass media news outlet in order to misinform the general public, and sell more pharma products. This is the kind of tactic they have used for years to undermine public health, justify youth Suicides, and enrich these ghoulish corporations. They don’t have to get scientists or smart people to believe it, they only have to get a few greedy corrupt lawmakers, politicians or public health administrators to repeat it. At our local low income mental health clinics, they have been using policies from pharma to cut back on staff, and replace them with “Peer Counselors” people with their own MH issues. The Fact that this has led to more problems, is easily avoided, since these people are counted as “Employed.” The Fact that many people who are prescribed these medications, never see a psychologist, or psychiatrist, as the suicide rate increases, can be easily ignored. Most Americans believe that “Mental Health is what they see on TV, or in the Movies. In reality it is a low income clinic where laypeople give out these medications. The clinics have cut back on any staff in order to provide more medications. Many of these low income clinics are religious non profits, and have no accountability, even when their patients are killed in a hail of bullets. In Post Fact America, the deaths are inconsequential, as long as these corporations are profitable. This is almost Orwellian, and it is typical of the Alternate Facts the administration, and their industry insiders are peddling at the FDA, the CDC, and the NIH. The NIH has chosen to fund useless low quality pseudo sconce studies, which are then used to advertise products. They claim they never claimed that their long letter on warnings ever claimed there was a causal association between the warning. decreased drug use and increased suicide rates. if so why did they waste all those electrons misleading the public about this and call for the removal of the warnings. Their response assumes the readers are idiots. We are not. they cite 2 of thousands of articles however neither of these or any other claim drugs reduce suicde rates. There sure is a lot of cherry-picking in these graphs, with time periods and the places chosen to start and end the separate “trend lines” varying in accordance with what will suit the argument. Note the very different span of years chosen in the last “suicide rates” graph, for obvious reasons when you picture what the second trend line would have looked like if it had used the same time period as the others. Reminiscent of the graphs in Michael Crichton’s novel purporting to prove there was no such thing as climate change. And as for the traaaagic decline in SSRI use in children – that’s not “unwanted”, it was wanted and rightly so, since SSRIs don’t benefit most kids labeled with depression and do put them at risk for side effects and likely long-term dependency. First chart: Thank you for reproducing another graph from our BMJ paper. Importantly, you misinterpret the time series of antidepressant use. The red line shows the predicted post-warning trend following a steep increase in baseline trend. There was a large and sudden 31% reduction in medication use from the baseline trend (that is modestly affected by the flattening utilization). The second graph in our essay documents a nearly 50% decline among poor Medicaid adolescents (from a flat trend) soon after the warnings. It is not possible to detect change without carefully comparing with baseline trends. Such post-only designs are routinely excluded from evidence in Cochrane and other international systematic reviews of health policies and interventions. http://epoc.cochrane.org/epoc-specific-resources-review-authors. •	Worse, the omitted baseline CDC trend data actually show a steep, pre-existing decline in suicides (1999-2003). Your analysis erroneously credits the warnings for lowering suicide rates when in fact, suicides were already decreasing. •	It is not possible to distinguish between effects of several closely packed warnings, so concentrating only on black box warnings is futile. Typically these “opinion” authors do not have to divulge their funding. Another clever bit of deception. They should be forced to have to care take a person with brain damage from one of these drugs. It is unlikely they have ever seen how an overdose on one of these drugs, is treated at their local ER. Pharma and other industry lobbyists made sure the numbers could not be counted. These authors are using their university positions to now only peddle dangerous drugs but deliberately mislead the public. It is not a coincidence that the FDA, just recently became concerned that the long list of side effects in pharma advertising, could interfere with marketing and profitability. The FDA was supposed to protect Americans from these unscrupulous corporations. Now they are in cahoots with them all. The Black Box Warnings, failed to promote any scrutiny of these prescribed drugs. The industry responded by limiting the collection of data. Most tellingly there are no studies of the long term effects of these drugs, by design. The Physicians and others prescribing them, believe they are “better than suicide,” due to this kind of deceptive, and misleading marketing. Many states allow Psychologists, Social Workers and Physician Assistants to prescribe these drugs, with a 5 minute consultation. This is driven by industry marketing and under-funding mental health clinics. 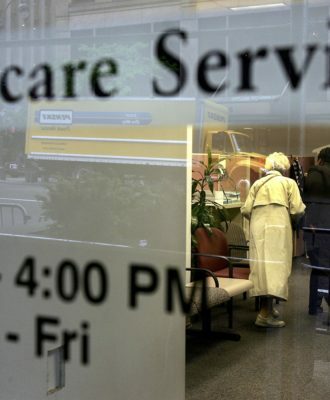 The industry ensured their profits as mental health clinics had their funding cut. They lobbied state and federal legislators, to allow anyone to prescribe these drugs. They did the same thing with Anti Psychotics. Those are still being prescribed by these same laypeople, even though in some cases they are proven cause Death. The controversial claim being made here is that the inevitable reduction in antidepressants caused a spike in suicides. The use of a rising all-cause psychotropic poisoning rate as a proxy for suicide is controversial, and no justification is forthcoming. Instead, their own graph shows overall youth suicide FELL in the immediate aftermath, and actually tracks the rate of antidepressant prescribing. Why no explanation of the proxy? The contradiction with the real suicide data?